Pantone Spring 2017 Color Trends: Greenery, Pink Yarrow [Part 4 of 5] – Design Your Lifestyle. February 2017 February 2017 Peter Salerno, Inc. 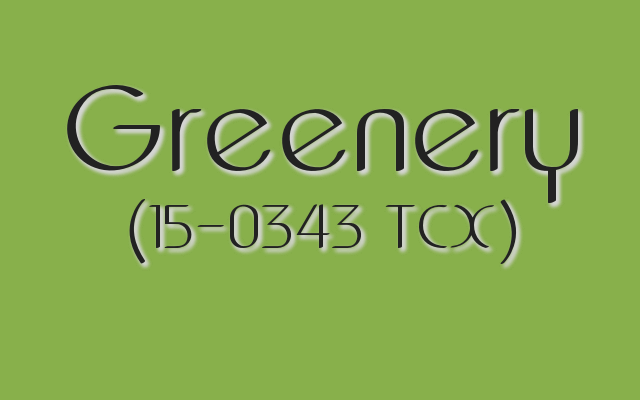 When Greenery (15-0343 TCX) was announced as the 2017 Pantone Color of the Year, it signaled a trend towards naturally occurring colors. The cheery, optimistic freshness of Greenery was a welcome sight to many, as it indicated a “happy” set of Spring 2017 Pantone colors. And boy, they didn’t disappoint! The question that followed in the weeks after the announcement of the 2017 Pantone Color of the Year was relatively universal: “What colors can I pair (or should I pair) with Greenery?” Well, as part of the Spring 2017 Pantone color palette, there are a few options – but one particularly pleasing match. 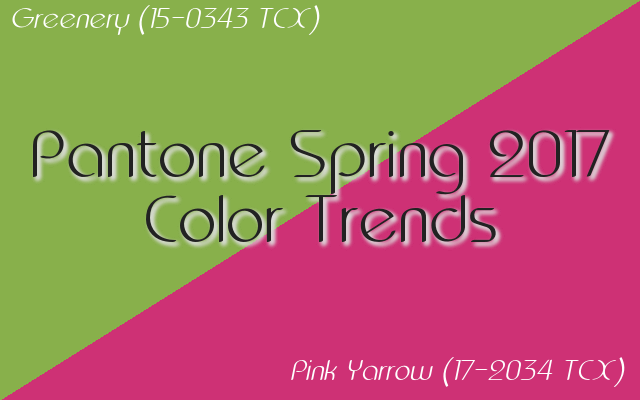 Pantone Spring 2017 color trends: Greenery and Pink Yarrow. 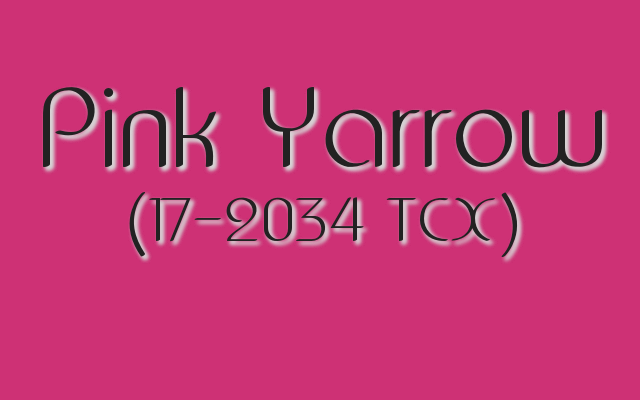 Enter Pink Yarrow (17-2034 TCX), a blazing hot pink plucked straight from the warmest flower petals. Whereas many green/pink matches rely on a bold green and soft pink, the Greenery and Pink Yarrow combination works for a diametrically opposite reason. The heat of Pink Yarrow set against the fresh Greenery creates a fresh palette that reminds us of hot pink flowers over the soft green of grass or a garden base. While it may be “safer” to pair Greenery with another Spring 2017 Pantone color selection (such as Primrose Yellow or Niagara), we don’t think the dividends are quite as high as the stunning pairing you can create with Pink Yarrow. Let’s take a look at both colors individually in Part 4 of our 5-part series on the Spring 2017 Pantone color collection. Pantone goes so far as to call Greenery (15-0343) “Nature’s Neutral” in their official 2017 Color of the Year announcement. Greenery is more towards the “yellow side” of green – think more Kermit, less Green Arrow – and evokes a fresh, invigorating sense of the outdoors. Greenery is found more in light green grass and sunlit floral leaves than in dense foliage, adding a sunny, optimistic touch to the natural relaxing quality of green. Pantone Spring 2017 color trends: Greenery, the 2017 Pantone Color of the Year. Home designers, fashion designers and graphic designers alike turn to PANTONE, the world’s foremost authority on color, color identity and color matching, to establish future trends and baselines for their work. The announcement of Greenery as the Pantone 2017 Color of the Year re-affirms the trend towards natural, refreshing color palettes in home design, graphic design and spring fashion. The trend towards natural, earth-based design should include natural green elements! Use real greenery in your home designs! Incorporate fresh floral sprays, vegetables, leafy arrangements and ferns in your kitchen and bath designs. Color lovers waiting for Pantone to put out a truly “VA-VA-VOOM” color in the Spring 2017 collection are officially in love. Pink Yarrow (17-2034 TCX) trumps them all – even the bold Flame – in sheer flair and brilliance. Pink Yarrow brings a tropical mood to the floral elements of the Pantone Spring 2017 color palette, and pairs with the 2017 Color of the Year in a dramatic, eye-popping way. Pantone Spring 2017 color trends: The arresting Pink Yarrow turns heads. At first blush (pun intended), Pink Yarrow seems more like a cosmetic shade – and for years, it has been. But the transition into wardrobe on the Spring 2017 runways has been quick, stunning and seamless. Stay with Design Your Lifestyle over the next several weeks, as we continue to feature the ten beautiful hues that make up the Pantone Spring 2017 Color Design Report! Pingback: Pantone Spring 2017 Color Trends: Island Paradise, Pale Dogwood [Part 3 of 5] – Design Your Lifestyle. Pingback: Pantone Spring 2017 Color Trends: Lapis Blue, Flame [Part 2 of 5] – Design Your Lifestyle. Pingback: Pantone Spring 2017 Color Trends: Niagara, Primrose Yellow [Part 1 of 5] – Design Your Lifestyle. Pingback: Pantone Spring 2017 Color Trends: Kale, Hazelnut [Part 5 of 5] – Design Your Lifestyle.